Thank you for visiting us in the adoption clinic for your child’s care. As a social worker I see many newly formed families each week. I’m writing to you to talk about the range of feelings experienced by new adoptive parents. You probably learned about some of them during the home study process. You read about post adoption depression and thought, “yeah, I can imagine how that happens to OTHER parents. But I’m sure those parents didn’t prepare or have supports like me.” And then you got busy…busy with the paper chase and the getting the room ready and the packing and the imagining and the planning. And in some ways, you’re right. Families like you who come to see us in clinic express a variety of emotions at those first few visits, ranging from overwhelming joy at finally achieving the dream of parenthood, to exhaustion from the duration and stressors of the trip. I’ve just made the biggest mistake of my life. I’m afraid I’ve destroyed my family. I feel like a terrible person. How can I possibly fall in love with this kid? 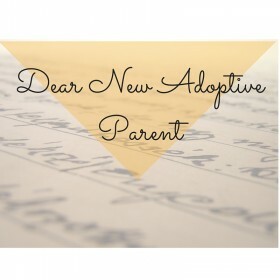 So I’m writing to you, dear new adoptive parent, because I care about the well-being of you and your family. You are NOT crazy. Other parents have walked in your shoes. Adoptive parent, I need you to know it is common for each spouse in a couple to feel differently from one another after adoption. I want you to know I have talked to MANY parents who’ve shared feelings similar to yours and I’ve talked to those same parents 6 months later, and I’ve learned, IT GETS BETTER. I want you to know there are many possible reasons you feel the way you do right now and NONE of them mean you are a bad parent or a bad person. Most importantly, I would like you to know there are things you can do to begin to feel better. It takes courage, and it’s certainly not easy, but hard work and fear clearly didn’t stop you from pursing international adoption, did it? Find someone to talk to. Believe it or not, your adoption social worker has probably heard these feelings before. Seek out other adoptive parents (especially those of children with special needs) to lend a listening ear. It takes strength, I know it does—but it helps to know you’re not alone. See your doctor. Especially if you start to have thoughts of harming yourself or your child. But really, there is no reason to suffer in silence. During the pre-adoption phase prospective adoptive parents are often working literally day and night to prepare for the adoption. During this time they are fueled by adrenaline. High levels of cortisol and other stress hormones are surging through your body. Suddenly you are half way around the world for weeks and your sleep cycle is disrupted. And a stranger just joined your family. Frankly I’m surprised there aren’t MORE adoptive parents struggling with feeling depressed, anxious, and utterly overwhelmed immediately after adoption. Many parents find the short-term use of an anti-depressant can bring significant relief to feelings of despair. Do SOMETHING to take care of you. When you’re on the runway, the flight attendant instructs parents of small children to put their own oxygen masks on before helping their kids. This is the same idea. What helped you minimize feeling overwhelmed before you started the adoption process? Taking a walk? Taking a nap? Reading a book? I know—you can barely find time to take a shower. But listen to me—find your spouse, your sister, your uncle, your parent, even a paid college student to help out a few hours here and there…this is NOT the time to panic about allowing other people into your child’s world too soon. This IS the time to help yourself get regulated so you can effectively build a healthy attachment with your child and get on with this business of being a family. 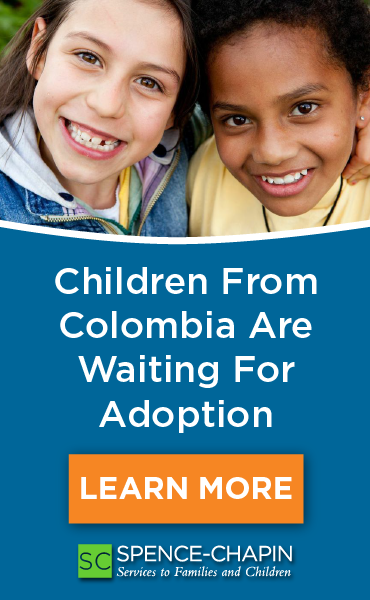 This article was generously shared by the University of Chicago Adoption Center whose mission is to provide exemplary care, advocacy and research to meet the unique needs of healthy and medically complex orphaned children and their adoptive familes.